The BodyHealt Waterproof Adjustable Universal Drinking Cup Holder gives you unlimited possibilities of mounting locations. It hold cups and bottles with an easy reach. It is the perfect cup holder for your wheelchair. You don't have to worry about removing it every time you collapse your chair. Now you can keep your drink without spilling it. Your hands are free to get your wheelchair around. You'll save from spilling drinks in your lap. Learning to live in a wheelchair is difficult enough but the addition of the cup holder is marvelous. In addition to carrying drinks, It is useful for carrying small items, mail, gift bags, and more. It clips on very easy and this one stands out. The design of the cup holder makes it easy to click on or pop off. This is a very useful product not only for wheelchairs and strollers but also while driving your car, placing it on a bicycle, while practice playing your drumset and more! This is invaluable for drinks to keep your drinks from spillage. The holder gives you unlimited possibilities of mounting locations. BodyHealt Waterproof Adjustable Universal Drinking Cup Holder is exactly what you needed for your upcoming road trip. A nice product that fits your deck railings well and perfect for those outside gatherings. GREAT ACCESSORY. Simple yet effective, this cup holder has a large capacity to accommodate a variety of cups and bottles. The design makes it easy to click on or pop off of tube frames, while the black color seamlessly fits into any location. It blends in so well, that it looks like it was already part of your "mobility adaptive equipment." UNIVERSAL, ADJUSTABLE FIT. The adjustable cup holder provides you with unlimited possibilities of mounting locations. 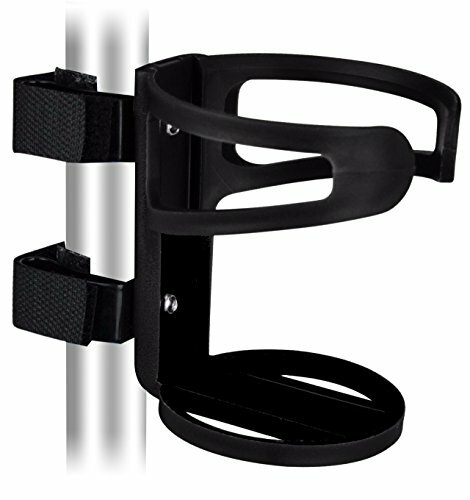 It's the perfect fit for strollers, walkers, bicycles, wheelchairs, bed railings, canes and even on drum sets! LIGHTWEIGHT PRODUCT. Made from solid plastic for long-term durability and use, this universal holder is lightweight and compact in size. As a result, it won't add cumbersome weight or bulk to the product it's attached to. TRAVEL WITH EASE. This is a wonderful addition to have when traveling or out and about. By allowing a way to safely hold a cold or hot drink, this convenient product enhances all of your travel experiences. Working perfectly when your car has no cup holders, it does a great job of holding a mug while you're driving or relaxing as a passenger. PERFECT GIFT IDEA. In addition to carrying drinks, this holder is useful for carrying small items, mail, gift bags and much more. As such, it makes a perfect gift for birthdays, holidays and other gift-giving occasions for anyone special in your life.